Scottish Government has overturned an attempt by Sepa to protect residents from noisy flaring at the Ineos plant in Grangemouth. Permitted development rights are being further extended â€“ albeit with a scrutiny of amenity issues. Bradford Council has introduced powers to fine noisy cars. It has agreed a public space protection order with wide ranging powers to stop anti social use of vehicles and noise from car stereo systems. The order is far wider in scope than orders used elsewhere that focus on car cruising, as seen in the West Midlands and Essex (Noise Bulletin July 2018 p5). Electronic noise â€˜blockingâ€™ can work as well as actual glazing, researchers claim. Westminster Parliament is to launch an inquiry into fireworks. Last month Scottish Government launched a consultation along similar lines (Noise Bulletin March p4). A petition has been launched on wind turbines..
Lawyers representing a coalition of local authorities opposed to Heathrow expansion have been in the High Court challenging the Governmentâ€™s Airport National Policy Statement backing Heathrow expansion and demanding it be quashed. Aviation regulations for a possible Brexit have been discussed in Parliament. Stop Stansted Expansion is to commence legal proceedings to challenge the decision by communities secretary James Brokenshire not to intervene in the decision by Uttlesford District Council to approve the expansion of Stansted Airport to 43 million passengers per annum (mppa). 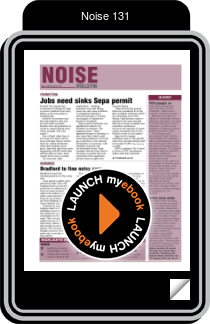 The new Homes Act updates housing hazard regulations â€“ noise is one of the 29 â€œthingsâ€� that can form a hazard. The Association of Noise Consultants awards are open for 2019. Sealed windows have been rejected at appeal near the A23 trunk road near Crawley. A request to put a terrace onto the roof of an attached garage has prompted a huge row over transmitted noise. A paper sets out how a guide to overheating and acoustics can be applied in new developments. 261 homes sandwiched in between the M61 and M6 motorways in Bamber Bridge have been allowed at appeal. A huge surge in the installation of air source heat pumps is set to follow from a new government edict banning gas boilers from 2025. Lisa Russell reports. There is a short sentence in last monthâ€™s government Spring Statement that on the face of it has nothing to do with noise â€“ but is raising concerns about the potential for an increase in complaints in a few yearsâ€™ time. Two field studies (one in Poland and one in the Netherlands) with 233 valid respondents in total, and three laboratory studies in Sweden with a total of 59 subjects over 350 person-nights were performed in a study of rail based sleep disturbance.